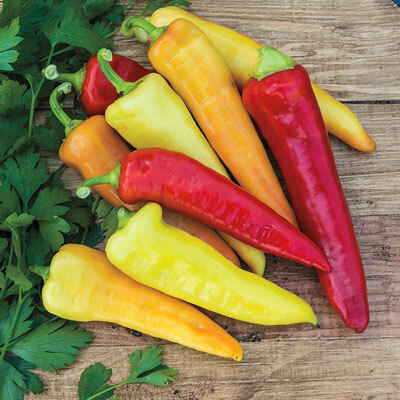 Sweet Banana Sweet Pepper | Henry Field's Seed & Nursery Co.
Elongated, 6-in. peppers turn scarlet when fully ripe but stay sweet and mild. Delightful in salads, exquisitely pungent pickled. Famous for its amazing yields. 68 DAYS. Seed counts: 100 seeds sow a 20-ft. row. Height 16 - 24 inches. Height: 16 - 24 inches. Spacing: 18 - 24 inches between plants; 24 - 36 inches between rows. Depth: Seeds : 1/4 - 1/2 inch. Plants at the same depth as in the pot. Days To Maturity: 68 days from transplant. Soil Requirements: Rich, well-drained soil. ; pH 5.5-6.8. Fruit: Sweet, mild, waxy, thin walled. Tapers to a blunt point. 6 inches x 1.5 inches. Yield: 60 pounds per 100 foot row.